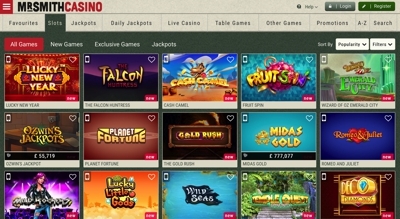 Formerly known as Harry Casino, Mr Smith Casino is a relatively new addition to the world of online casinos, joining the fun and games as recently as 2011. They are part of BML Group Ltd, who are registered and based in Malta, and licensed by Malta’s Lotteries and Gaming Authority. BML are in turn owned by Betsson AB, who are a sizeable Swedish gaming company based in Stockholm with many years of experience in the industry. Listed on the Swedish Stock Exchange, Betsson offer the financial clout to BML – and by extension Mr Smith Casino – which means players should have little to fear in terms of the company’s financial stability and integrity. Mr Smith Casino offers further assurances about its fairness by using the SHA1 Random Number Generator developed by Sun Microsystems to generate the outcomes of their games, a tool which has been independently tested and approved by two certification bodies: the National Laboratory for Forensic Science (SKL) in Sweden and the Technical Systems Testing (TST) in Canada. The parent company are also audited by Price Waterhouse Coopers, so all in all it is safe to say Mr Smith Casino are a perfectly legitimate gaming outfit. They have over 200 games available to customers including classic and contemporary table games, classic and video slots and video poker and most are available to play instantly rather than having to download extra software. You can also access a fair number (28 at the time of writing) of games through a mobile device, including blackjack, roulette and Gonzo’s Quest. You can also sample most of the games in ‘play’ mode before you commit any of your own money. Their Casino Tournaments feature will appeal to many, with one or (usually) two tournaments occurring daily whereby if you play a specified game the casino will enhance the prize money available. They have a 24/7 customer service provision by email, phone or live chat, with helpful and friendly staff. If you are looking for a bright, fun, in-your-face casino with a good variety of games, Mr Smith Casino could well be the one for you. Mr Smith Casino, as the name suggests, only has a casino. But they do it very well – with more games than you can shake a stick at from more software providers than you can count (well, on one hand at least). And, like any good casino, they also offer a VIP program, and if you get your buddies involved too you can earn yourself some free cash in the refer-a-friend program.